Adidas responded to the March 12, 2018 letter from more than 130 Palestinian football clubs and sports associations demanding that Adidas drops its sponsorship of the Israel Football Association (IFA), which hosts clubs based in Israel’s illegal settlements. We appeal to Adidas to follow its own advice: to respect international law and Palestinian human rights by ending its sponsorship of the IFA as long as it hosts clubs based in illegal Israeli settlements. Israeli settlements violate Palestinian human rights. They are built on stolen Palestinian land and restrict Palestinians’ freedom of movement and access to water, fertile lands and livelihoods. Furthermore, according to the Fourth Geneva Convention, Israeli settlements are war crimes. 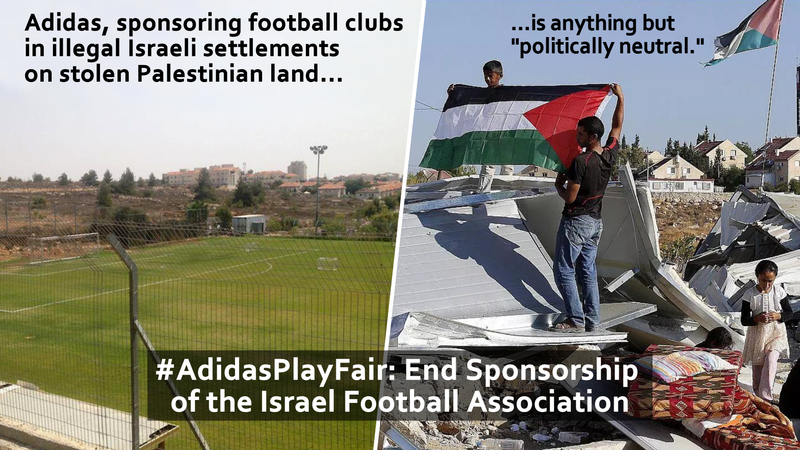 This makes Adidas complicit in serious Israeli human rights violations through its IFA sponsorship. Adidas’ letter also says, “Adidas acts in a politically neutral way.” But as South African anti-apartheid leader Archbishop Desmond Tutu once said: “If you are neutral in situations of injustice, you have chosen the side of the oppressor.” Adidas is not merely selling its products to the national football association of a state that is involved in a decades-long illegal occupation and the grave violations of human rights entailed in it. It is sponsoring it. Adidas, therefore, is anything but “politically neutral” in this case. Clinging on to hope and insisting on fulfilling their passion for the beautiful game, Palestinian amputees, who have lost limbs in Israel’s repeated attacks on Gaza, have recently formed a football club. Adidas says it works in accordance with the UN’s Guiding Principles. It is based on these guiding principles that the UN Human Rights Council has established a database of companies complicit in Israel’s occupation. Adidas risks being included in this database. The sponsorship will not only make it target of popular boycott but also of institutional divestment campaigns including at the state level. Adidas ended its sponsorship of the International Association of Athletics Federations following the doping and corruption scandals. We urge Adidas to “do no harm” to Palestinian human rights, and to cancel its complicit sponsorship of the Israel Football Association.